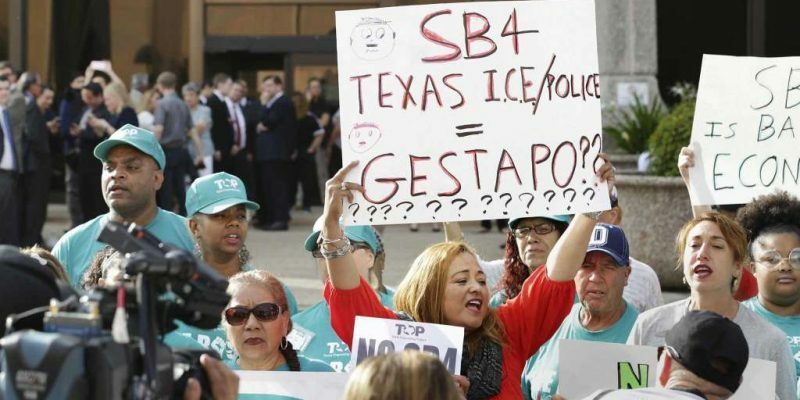 A three-judge panel of the United States Court of Appeals for the Fifth Circuit on Tuesday largely upheld the Texas immigration law, Senate Bill 4, which bans sanctuary city policies in the state. Senate Bill 4 (SB 4) does not require all officers to ask about a person’s immigration status. It allows police officers to question the immigration status of anyone they arrest or detain, including during routine traffic stops, at their discretion. According to the New York Times, the Houston Police Department said officers had asked detainees about their immigration status only twice since September. In Austin, only once. The Times points out that there is a disconnect between the law that was passed and officials sworn to uphold the law who aren’t in the primarily Democratic-led cities. SB 4 doesn’t only prohibit sanctuary city policies. It also mandates that officials who violate the law be fined, jailed and removed from office. After SB 4 became law, the cities of Austin, Dallas, Houston and several counties sued the state to block the law, arguing it was unconstitutional. The appeals court disagreed. Lawyers representing the group suing the state said they were considering appealing the decision to either the full Fifth Circuit or to the U.S. Supreme Court. Parts of the law went into effect after a court ruling last September. Now, the court’s ruling allows for nearly all of the law’s provisions to be implemented. Previous Article Chemical Plant Explodes Near Dallas Because Worker Drags His Shoe?